Previous scholarship has acknowledged the importance of the Stratford-upon-Avon Guild Chapel scheme within the context of late medieval English wall paintings (Rosewell 2008). However, its international significance has been unrecognised, perhaps because of the poor survival of much of the scheme. Although the potential of individual sources, such as Fisher's lithographs, to shed light on the now-lost images has been highlighted by more recent researchers (Davidson 1988; Mooney 2000), there has been no systematic attempt to reconstruct the scheme in its entirety, or to set it within its original architectural context. The project on which this article is based originally sought to address this issue through the reproduction of a virtual model of the scheme, using relevant antiquarian drawings to 'reconstruct' the medieval appearance of the Guild Chapel (Arnott 2008). However, critical engagement with current literature on virtual modelling and digital heritage technologies has subsequently transformed the project into a much more innovative use of the digital model as a research tool. 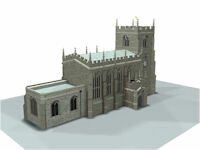 In 2007, following initial research on the Guild Chapel carried out as part of a conservation management plan (Clark and Giles 2006), Geoff Arnott (2008), then an MSc student on the Archaeological Information Systems in the Department of Archaeology, University of York, sought to build a 'virtual model' of the Stratford-upon-Avon Guild Chapel. The original aim of the project was to reconstruct the appearance of the paintings within their architectural context, something that was missing from both antiquarian and more recent scholarly illustrations of the scheme, in which two-dimensional plates and figures were simply reprinted in their consecutive sequence, accompanied by detailed textual descriptions (Davidson 1988; Fisher 1838). The potential of this approach had been demonstrated by the reconstruction drawings of Wilfrid Puddephat (1958), whose depiction of the Dance of Death within its original mural context had helped to explain its relationship with the architectural structure of the rebuilt Chapel, and with later schemes of painting. Arnott's project used as its primary data the records of the Guild Chapel paintings as exposed in 1804, made by Thomas Fisher and subsequently published by Nichols (in Fisher 1838). 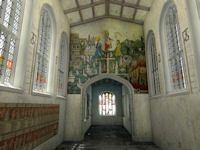 The output of the project was a web-based resource that would ensure the dissemination of the reconstructed image to as wide a scholarly and public audience as possible (http://www.heritagetechnology.co.uk/portfolio/stratfordchapel/stratfordchapel.html. The first stage of the project involved a new metric survey of the Chapel. The primary methods of data capture were the creation of a 200-photograph archive of interior and exterior details, including details of the surviving paintings, and a metric survey using an REDM (Reflectorless EDM). 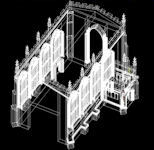 Using these datasets as a framework, the 3-D model of the chapel was created in CAD with the REDM points providing metric accuracy and photographs for reference and details (Figure 13). Much was learned during the survey process about the suitability of conventional metric survey techniques for the creation of digital models. The millimetre-scale accuracy of the spatial data created by the REDM meant that all elements could be cross-referenced, ensuring that the spatial integrity and accuracy of the model was not compromised, even when working from photographs. However, although extremely sparse in comparison to photogrammetric or scanned data, the number of survey points recorded (3500) still proved problematic. The survey data in its 'raw' form from the REDM required significant reworking in order to produce the basic set of plans, sections, elevations and architectural moulding profiles required to create the model. This led to an interesting and somewhat unorthodox conclusion that, for modelling purposes, metric accuracy and detail must be subordinate to the creation of an efficient model that can be further manipulated beyond CAD. The aim of this particular exercise was not, in the end, to produce a detailed record of the fabric of the building, but rather to provide a representational framework on which to hang an academic exploration of the vanished wall paintings. Perhaps the project would have been better served by simply modelling from reference photographs with a small number of key measurements to provide control at a basic level. These findings are of significance because of the increasing tendency of archaeologists to use high-data density survey techniques, such as close-range photogrammetry and laser scanning, which, while providing detailed models of a structure, may be too complex for some forms of visualisation. Once the basic geometry of the model was completed in CAD it was exported into modelling software for the final stage of adding the materials, lighting and the wall paintings. Materials were created and applied to the model to represent the freshly whitewashed interior of the chapel as well as the glass, floor and ceilings. Digital copies of Thomas Fisher's drawings and Wilfrid Puddephat's reconstruction of the Dance of Death were created and applied as further textures to the appropriate section of the Chapel walls. The model was lit with a combination of Global Illumination and an additional lighting rig and rendered using Mental Ray (Figures 14-15). Camera perspectives were added to the interior of the model from which cubic panoramas and a series of still images were then created. While this final set of images is static, it comprised the key asset for the later creation of a more dynamic, interactive visualisation of the wall paintings in the digital model presented in this article. Figure 15: Interior rendered image of the Guild Chapel by Geoff Arnott based on images from Fisher (1838 (© Shakespeare Centre Library and Archive Fol. 87/33, reproduced with permission of the Shakespeare Birthplace Trust). Considerable attention was paid during the modelling process to issues such as the texture of lime plaster and the colour of medieval pigments. Fisher's original lithographs were individually hand-coloured, using Victorian pigments. There was therefore some variation in the colour and texture of each print, and it is not clear whether Fisher sought to match his pigments to the colour of the paintings as exposed or, as seems more likely, to try and reconstruct the vibrancy of the originals using colours available to him at the time. In contrast, Arnott (2008) sought to recreate a more subtle appearance of the paintings, using references in the guild accounts of 1427/8 to particular pigments as a basis for the reconstruction. One new interpretative element added to the model was the reconstruction of a blue ceiling over the chancel, covered with gold stars. This was a common form of medieval ceiling decoration, traces of which survive in many medieval parish churches today, including remains of such a scheme in the Guild Chapel in Stratford's parish church of Holy Trinity.